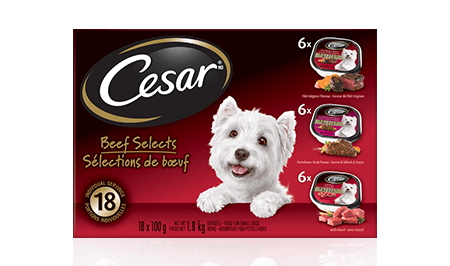 CESAR® ENTRÉES : 6 WITH BEEF + 6 WITH FILET MIGNON + 6 WITH PORTERHOUSE STEAK 18 X 100 g is rated 4.5 out of 5 by 48. Rated 5 out of 5 by PATTYSNS_362848438 from i was pleasantly surprised with this product. the ingredient list was of high quality. my dogs, who are fussy, devoured the food before their dishes hit the floor. the meat looked palatable and smelled really good. in fact, the dogs came running to be fed, when they heard me in the box. it was really easy to get my senior dog to take her daily medication, simply by putting it in the food. otherwise, she is able to find it . i will definitely purchase this as part of their regular food. Rated 5 out of 5 by MARIAPON_362863957 from My dog finished eating the entr�e within seconds, he absolutely loved it. I normally give him dry food and I wouldn't make the switch completely, but this makes a good treat for him. My vet did say that providing a dog with these meals consistently is like eating a big mac on a regular basis, so should only be a treat. Rated 4 out of 5 by CAROLEDAB_362856018 from I received a coupon to redeem for a free package of CESAR Beef Selects Wet Food for Small Dogs in exchange for my honest opinion. My dog really loved it. The texture is perfect and I like the ingredient use. The packaging is easy to open. My only problem is the cost as I need 3 to 4 tray per day to feed my dog. Rated 4 out of 5 by DEANNAKON_362879257 from My dog loves these Cesar wet foods. I've never seen her eat anything so fast! I give them to her as a treat occasionally. I have to give them to get occasionally because eating them regularly gave her bad diarrhea. That was the only issue I had with it. Rated 4 out of 5 by IRENEDMB_362858855 from I make my own dog food so this was a real treat for my pet. I had a hard time finding it in the local stores, but with your tip only at wall mart. She just woofed it down. It will be great when one travels. This will be her special treat. Rated 5 out of 5 by DIANNAWQC_362850334 from Our Yorkies is Loving the Cesar Beef selects. He has tried all 3. He enjoys the Filet Mignon, Porterhouse Steak, and the Beef equally. Thank you so very much for allowing us to try these products for free. We will definitely buy Cesar. CESAR® Entrées With Beef Food For Small Dogs is formulated to meet the nutritional levels established by the AAFCO Dog Food Nutrient Profiles for maintenance. CESAR® Entrées Filet Mignon Flavour Food For Small Dogs is formulated to meet the nutritional levels established by the AAFCO Dog Food Nutrient Profiles for maintenance. CESAR® Entrées Porterhouse Steak Flavour Food For Small Dogs is formulated to meet the nutritional levels established by the AAFCO Dog Food Nutrient Profiles for maintenance. MEAT BY-PRODUCTS, LIVER, BEEF, CHICKEN, CHICKEN BY-PRODUCTS, MINERALS AND VITAMINS, GUMS, COLOUR, DRIED YAM, NATURAL FLAVOURS, SODIUM NITRITE (FOR COLOUR RETENTION), WATER SUFFICIENT FOR PROCESSING. MEAT BY-PRODUCTS, LIVER, BEEF, CHICKEN, CHICKEN BY-PRODUCTS, MINERALS AND VITAMINS, COLOUR, GUMS, DRIED YAM, NATURAL FLAVOURS, PORTERHOUSE STEAK FLAVOUR, SODIUM NITRITE (FOR COLOUR RETENTION), WATER SUFFICIENT FOR PROCESSING.